1st Pet Naturals is a unique pet health website, dedicated to providing a natural treatment for every pet condition. Specializing in herbal pet remedies, the entire Vetisse line can be found at 1st Pet Naturals. Critter Cures offers pet owners a variety of pet supplies, including Vetisse. The entire Vetisse line can be found at Critter Cures. Yes Wellness offers top quality health and dietary supplements for you and your pet’swellness. You can find the entire Vetisse product line at Yes Wellness. 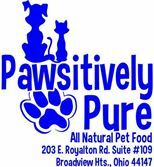 Pawsitively Pure is focused on providing high-quality, natural and nourishing products for your pet. They offer a variety of pet foods, treats, toys and supplements for cats and dogs.